The timetables below are for services that operated prior to 1981 – please click on the picture of the cover below to see the timetable. For timetables produced after 1981, please click here. Initially, the majority of the timetables on this page will mainly be from the 1970s, but we have also included a few from the post war period. If you are able to assist us by providingother timetables for the years prior to 1981 that we can scan without damaging, then we would be very interested to hear from you – please contact the Transpire Webmaster at transpirebus@gmail.com if you are able to help. Please note that to keep the keep the size of the PDF files down, indexes, adverts, conditions of carriage and timetables of services outside the Chesterfield / Peak District area have not been scanned. Please also be aware that timetables marked # in the description are held on other organisation’s websites, so clicking on the picture of the timetable will take you directly to that website. Note:Although the publications below covered all bus services operated by East Midland, timetables have only been reproduced here for services operating in the Chesterfield, Bolsover and Clowne areas. However, copies of timetables for other East Midland services can be provided on request. Woolliscroft (Silver Service) Timetable from the 1930s. 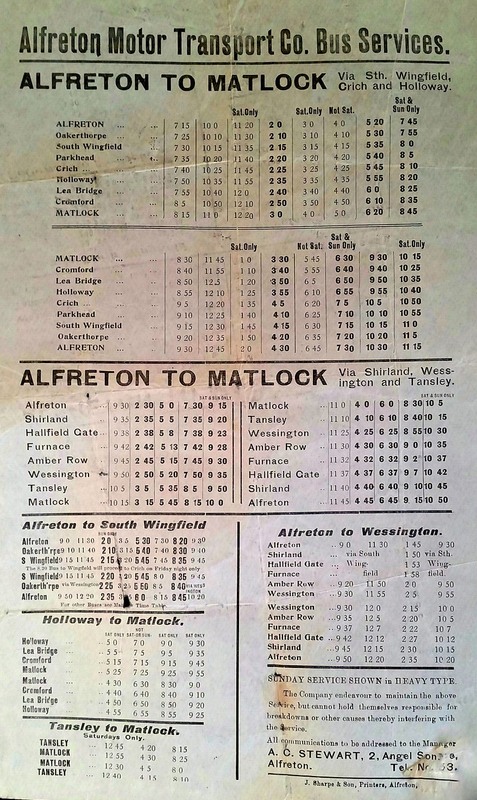 Hulleys of Baslow bus timetable from 1951 . . . . . . . . . . Note:Although the publications below covered all bus services operated by Trent and Midland General in the area concerned, we have have only reproduced timetables for services operating in the Chesterfield and Clay Cross areas. However, copies of timetables for other Midland General and Trent services can be provided on request. Timetables for jointly operated service 63 from Chesterfield to Nottingham, can be found in the East Midland timetable book. 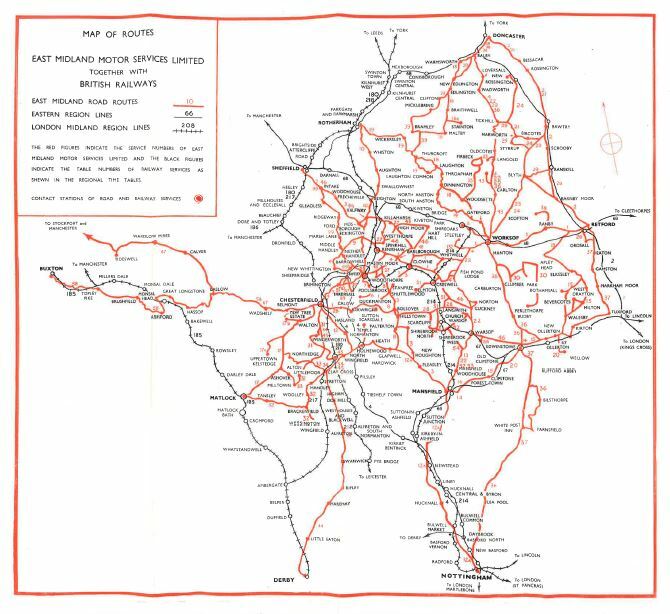 Further details of Midland General bus services can be found on the excellent Midland General Omnibus website which includes maps of that company’s services in the 1950s and 60s. 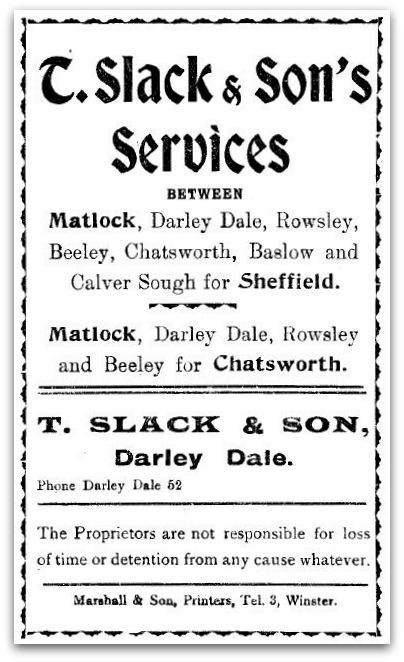 Prior to 1986, South Yorkshire PTE and its prececessors Sheffield Transport and Rotherham Corporation, also operated into Chesterfield, but only on services that were jointly operated with other companies. Copies of services from Sheffield to Chesterfield via Dronfield can therefore be found in the Chesterfield Transport timetable books, whilst those for service 10 from Chesterfield to Rotherham can be found in the East Midland timetables.